Synopsis: Would you risk your life to save your soul? 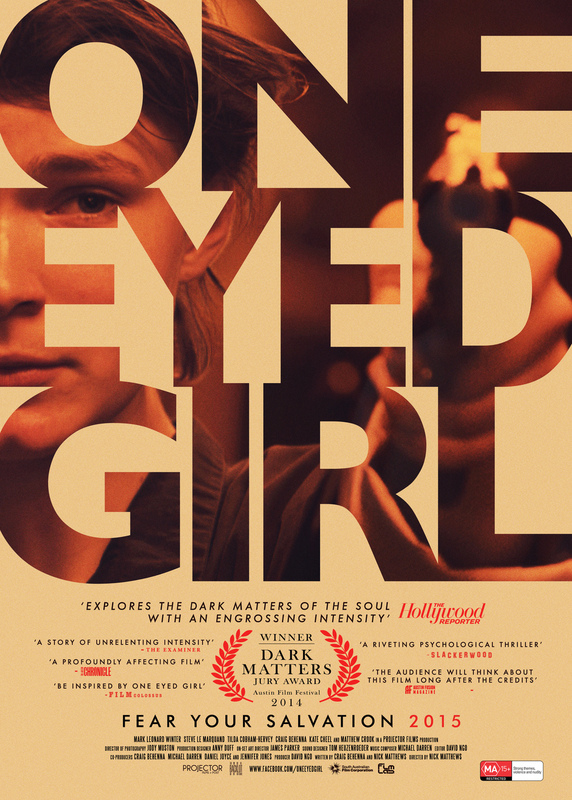 One Eyed Girl, a jury prize winner at the Austin Film Festival, is a riveting, accomplished, and dark thriller about Travis, a young psychiatrist who is haunted by the death of a patient. On the brink of a breakdown he meets a teenage girl named Grace, who invites him to a church run by charismatic leader. In search of answers Travis is led deeper and deeper into the underworld of a doomsday cult where he is given one last chance for redemption. NICK MATTHEWS did an honours degree in film at Flinders University before moving to Europe where he worked on productions including the Steven Speilberg/Tom Hanks HBO series BAND OF BROTHERS, and the Hugh Grant movie ABOUT A BOY as well as numerous BBC Productions. Since returning to Australia Nick has written and photographed the feature film MODERN LOVE (winner of Best Foreign Film, European IF festival, Paris, 2006) as well as producing, editing and photographing Murali Thalluri's 2:37 (officially selected for The Cannes Film Festival 2006) which also won Nick a Gold ACS Award for cinematography. In 2009, Nick formed a writing partnership with Craig Behenna. Their writing includes the feature films ANNY AND LUC TURN LEFT, TERMINAL and ONE EYED GIRL. In 2011 and 2012 Nick directed national TVCs for agencies Clemenger BBDO, Nation and JamShop, as well as the short comedy DEATH OF A BOGAN (Flickerfest, St Kilda Film Festival) and the SAFC funded drama COLLISION starring AFI Nominee Kathryn Beck (selected for the 2011 Melbourne International Film Festival, Flickerfest and Palm Springs).